I’ll be the first to admit that I don’t understand this generation of gamers’ focus on graphics and horsepower to make a first-rate video game. Most of my favorite video games had 8-bit or 16-bit graphics and so much re-playability that I still find myself gravitating back to them whenever I want to blow off some steam. As long as the game is fun, why should I care if it looks realistic or not? How do more realistic graphics enhance Pac-Man? Even Nintendo’s update of my favorite video game, Punch-Out! !, retained the same controls and play style, because it simply wasn’t broken. And no one can convince me that Final Fantasy VII for PlayStation is a better game than Final Fantasy III (or VI, depending on your count) for the Super Nintendo. Maybe I’m just lazy, but I usually like games that are intuitive—that I can understand how to play simply by picking up the controller or using my mouse, without a tutorial. About the only time I play video games these days is with my 10-year-old son, and he has a thirst for more complicated games. The repetitive skill-test games of the 1980s that I tend to like get boring for him fast. But there are games from the ’90s that I played that I looked for us to revisit, and I found they still had years’ worth of playtime left in them. The first one I looked for was Blizzard’s Warcraft II. For reasons beyond my understanding, it wasn’t available, so I moved to their sci-fi strategy game StarCraft. This is a game that I loved as a teenager and played more hours of than I’d care to admit. It was simple to learn, but difficult to master. In the game, you marshal an army and must annihilate your enemies and protect your allies. The constraints of the game are rigid; everything you can do has a proper order—to build this type of unit you must construct that type of building, and so on. But it has so much strategy to it that I find it creatively and intellectually invigorating. Introducing it to my son was a joy. He picked it up instantly. He’s not very good at it yet, but we’ve whiled away hours playing it together, side-by-side, destroying the foul Zerg armies and laughing about it. But since the game has such rigid boundaries, there’s something less than appealing to a youngster about it. Kids these days want fully explorable worlds and the ability to do just about anything. Which is why my son convinced me to buy Minecraft for us to play. I’m behind the curve on it; it’s been popular for a couple of years now. 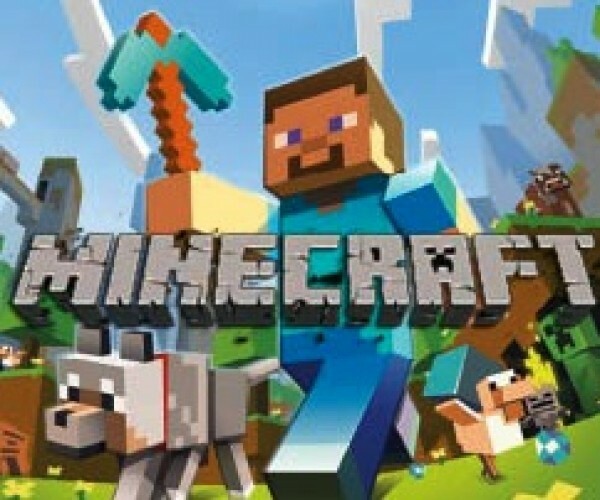 For those not familiar, Minecraft—no relation to Starcraft or Warcraft—is a game that opens a world that vaguely resembles the 16-bit games of my past, but is infinite. You play a blocky miner, and the point of the game is twofold: First, you must mine and craft all of your belongings—tools, food, transportation, potions, beds, household items, everything; second, you must survive. My son and I have spent the past couple of weeks playing it, and the limitless nature of the world is fascinating. I understand some of the appeal of exploring new parts of the world, hunting new animals and crafting new items. But the repetition in this game—mining rocks, for example—involves no skill whatsoever. It turns into button mashing at its worst. Perhaps I’m just doing it wrong. Different generations of gamers expect different things from their gaming experience, but I wonder if the thing we really should be expecting most is simply fun. Is Donkey Kong, a game that happens on one of three screens and utilizes one button, less fun or challenging than a sprawling war epic like Call of Duty? I don’t think so. Next time you’re playing a game, think about having more fun than worrying about an immersive level of detail. You might find that you like it.